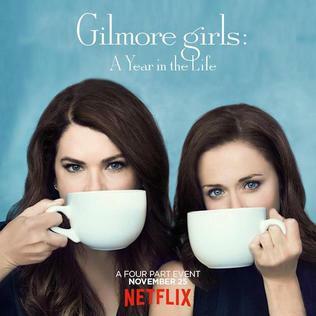 Gilmore Girls: A Year in the Life: Seriously? The title of this article was going to be "On Coffee, Caricatures, and Meta Cycles," but a) that's not catchy and b) I'm not totally sure that "Meta Cycles" is actually a usable term. So consider that a loose outline, and bear with me, fellow frustrated Netflix binger. A few weeks ago, I wrote about the things I wanted to see from Gilmore Girls: A Year in the Life. So, with coffee in hand, I sat down to watch all four episodes in one sitting on Friday. I finished at four in the morning with more emotions than I knew what to do with. By Saturday morning, all of those emotions had refined themselves into disappointment and irritation. Parts of this show were amazing. The pop culture references were on point, the town looked exactly like we had left it all those years ago, and the fact that nearly every single character returned in some capacity was absolutely fantastic. They drank coffee, they talked fast, and everything was as it should be. Watching these episode was like returning to an old friend. Except, in the ten years you hadn't seen each other, that friend had started a new life and all the two of you had left to talk about was old memories that you each remembered slightly differently. And, after the lunch you both painstakingly fit into your schedule, you're left with a vague feeling of unease, wondering if that conversation was as awkward as you thought it was. But you speak to that friend maybe once more, so you never find out for sure one way or the other. All that to say, watching these episodes felt like a dissatisfying fever dream. Between the wedding scene and the Life and Death Brigade scene, I'm not entirely convinced I didn't dream that these came out. The situations were fantastical and, frankly, unbelievable. The Life and Death Brigade defied all laws of rational belief. There's no way they could have gotten away with any of that. And the wedding was entirely unexplained. Kirk with a glitter gun? Really? That's the story you're sticking with? But I would be willing to forget all that. It's a reunion, they're having fun with it, I get it. I can't, however, forgive the caricatures they made of all my favorite characters. There's no way that Colin and Finn could exist as humans in the way they do in the show. Sookie wasn't Sookie--they needed a backstory to fill in until the Melissa McCarthy cameo. Because that's all it was. April the faux stoner? Yay stereotypes! And Michel. By giving Michel the adoption side plot, they took away most of his depth as a character. Plus, I just don't believe it. He cared for those Chow puppies like children. There's no way he wouldn't have any inclination to nurture a child of his own. But let's get to the real issue here: Rory. There is no way her life would have ended up like that. No way. We left her un-engaged and headed out on the road to be a journalist. As far as I can recall, that wasn't even mentioned. I get that Amy Sherman-Palladino wanted to end the show her way, but you can't just ignore that the last season happened. And, frankly, I'm glad she didn't finish the show. Because we find Rory homeless, having an affair, with a failing career. A shell of the interesting character she became throughout the series. The failing career--fine. She's a journalist. It happens. Though, after her stunt at the Stamford Eagle Gazette, I don't think she would have given up easily on, well, anything. But I'll accept it. I could even get over the fact that Logan took her back. He doesn't seem like the type who would stick to ultimatums. And it makes sense she could go back to him; she clearly wasn't done with him at the end of the series. But after the Dean debacle, I don't think she'd be as cavalier about being the other woman. Again. She tells Lorelai, and there's hardly any reaction. 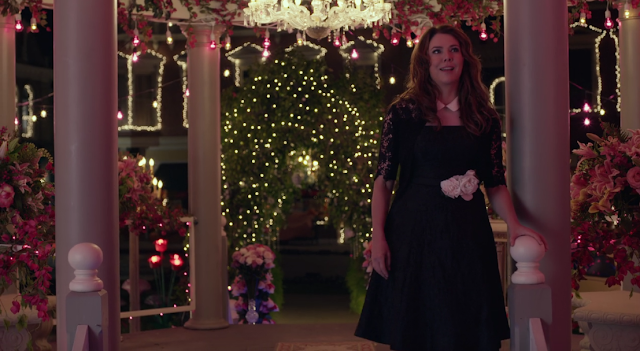 Was Lorelai just so fed up with Rory's life choices that she was like, "Yeah, okay, why not." Because that's about where I was at. She makes bad decision after bad decision, half-heartedly chasing good opportunities as she passes up others, using her friends and family because she travels all the time and can't be bothered to keep her life together. She didn't label her boxes. List-making, note-taking, excessively organized Rory didn't label her boxes as she moved out of her apartment. Not a chance. And Paul. Paul was a bad plot device to show just how terrible of a person Rory had become. Even if Rory became the type of person who would keep up an affair, she's not a cheater. She has too much self-respect for that. In trying to make her face the issues of thirty-something millennials, the writers took away all of her self-respect, dignity, and depth of character. Not cool. And the worst part of it? Not once does Rory read a book. At one point, there's a book she's barely started lying open on her lap, but that's not Rory. Rory reads everything she can whenever she can. It's not like she didn't have the time--she didn't have a house to take care of, didn't have a job. We see her with three cell phones but not a book. And that's the saddest part of all to me. Even including the dreaded last four lines. I get it. I get the cyclical nature of it. I get why Amy Sherman-Palladino wanted to do it. The point of the entire show was breaking the cycle. It was Lorelai breaking out of the privileged life. It was Lorelai learning from her mother's mistakes, from her own mistakes. It was Lorelai and Rory learning from the failed Emily/Lorelai relationship. It was Rory learning from her mother's mistakes, from her own mistakes. It was Rory making better choices. By having Rory single and pregnant at the end of the series, by having Logan be her Christopher and Jess be her Luke, Amy Sherman-Palladino effectively negated the entire series. It was like the Divergent trilogy, but worse. Because I was actually invested in these characters. The ending of these episodes was one of the worst endings I've ever experienced. And that includes watching How I Met Your Mother from beginning to end. Because even backing up a bit, having Rory write the book Gilmore Girls is the cheapest and most idiotic plot device that could have been used. Meta plot lines are never--NEVER--a good idea. It draws the audience out of the story and says to them, "I am more important than my characters. It is vital to my ego that you remember that this is something that was written. It didn't just happen." Okay, so maybe it's not that dramatic, but that's the general idea. It breaks the fourth wall in an immature and overdone way. I don't mind that Rory wrote the book; I think it's a great idea to have her write a book about herself and her mother. But to imply that what she wrote was the basis of the show was a mistake. And then we get to the point where she reveals that she's pregnant, and we're left with a black screen and the realization that Rory has learned nothing in the past sixteen years. That she hasn't matured at all--in fact, she backslid and became even more immature than she was at sixteen. Paris has matured, Dean has matured, Lane has matured, Jess has matured, but Rory--Rory is the 32-year-old child who makes bad decisions so that Amy Sherman-Palladino could finish the series the way she wanted to all those years ago. So I need another season. Or seven. If we like cycles so much, let's keep it going. I would understand if there was nothing else that ever came from Stars Hollow. It would make sense. But Amy Sherman-Palladino would lose all respect I had for her if she doesn't fix this. At the very least, I need to see good things happen for Jess. His character arc was so good; he made so much progress. I refuse to leave him pining through a window. I'm ready and willing to be happy with the residents of Stars Hollow again. But I need more. Am I wrong? What did you think the episodes? Of those final four words?